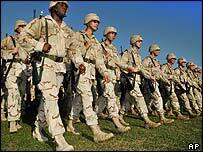 US President George W Bush has unveiled plans for a major shake-up of US forces around the world. Up to 70,000 troops currently in Europe and Asia are to be redeployed. 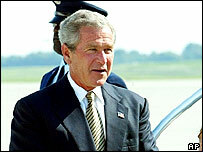 Most will return to the US, where Mr Bush says they will focus on new threats. He said the US would deploy "agile and more flexible forces" to face the challenges of the future. The move is expected to have the greatest impact in Germany, where the announcement sparked concerns. Details of the plan are still being worked out. But Pentagon officials say two heavy army divisions will be withdrawn from Germany - which is host to the biggest American overseas contingent outside Iraq. About half of the hundreds of US installations in Europe will be cut or closed, the officials say. Mr Bush made the announcement in a speech at the Veterans of Foreign Wars convention in Cincinnati, Ohio. The events of 11 September had changed America, he said. With the threat from the Soviet Union no longer existing, the US had been looking into the "force-posture" for the past three years. "The world has changed a great deal and our posture must change with it," Mr Bush said. "We'll ensure that our forces are well-prepared and well-positioned to meet the challenges of the future." He said 60,000-70,000 troops would be redeployed from Asia and Europe in the coming years - alongside 100,000 members of their families and support personnel. The US currently has almost 100,000 soldiers stationed in Western Europe and about 80,000 in the Far East. Some of the troops will be moved to posts in Eastern Europe while others will be based in the US, available for deployments overseas, according to White House officials quoted by the Associated Press news agency. BBC Pentagon correspondent Nick Childs says the US military sees many of the largely fixed US forces and bases in places like Germany and South Korea as outdated. Our correspondent says US deployments in Iraq and Afghanistan will not be immediately affected by this proposal - but its aim is clearly to reduce the strains on the military in future operations. He also says this was very much a campaigning speech, designed to underline President Bush's credentials as commander-in-chief. Ohio is a key battleground state in November's presidential elections. The announcement drew criticism from former Nato commander Wesley Clark - a senior adviser to Democratic presidential candidate John Kerry. "As we face a global war on terror with al-Qaeda active in more than 60 countries, now is not the time to pull back our forces," he said. A spokesman for the southern German city of Wuerzburg told AP expressed concern: "Base closures would hit us very hard." Wuerzburg is home to the US Army's 1st Infantry Division. Thousands of locals jobs depend on US forces. "Today's changes are intended to make the American military more flexible"